The Storage Made Easy Plug-In Client allows you to use a sophisticated Firefox plug-in as your control mechanism for Storage Made Easy. Firstly you need Firefox and secondly you need to download and install the plug-in. This should be done using the Firefox browser. If you try and download it using another browser the plug-in can have its default extension changed from .xpi to .zip which will make it impossible for you to install in Firefox. You can download the plug in from our Cloud Tools page. To install the Plug-In visit the Storage Made Easy Tools page and click on the Plug-In installation file. It should automatically install. If it does not and you are prompted to save the file, save it to a location and then choose File→Open from Firefox, locate the file and choose it. This will then enable the file to be installed. Note that Firefox will require a restart. Note that you can have multiple Storage Made Easy accounts using the PLug-In and change between them using the username drop-down. 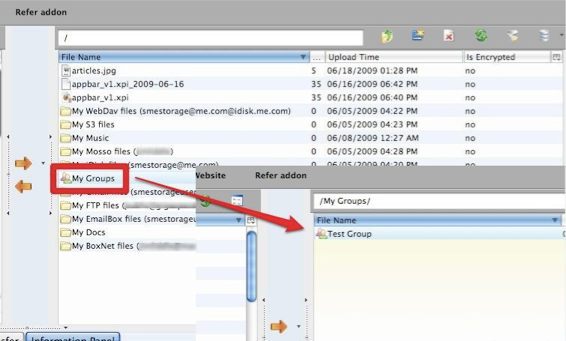 You should now see your file system on the left hand side and your Storage Made Easy file system on the right hand side. You can drag single/multiple files/directories (or shift select files and click the arrows) from one to the other and they will be transferred. You can see their progress in the 'Regular Transfer' tab. Note that Storage Made Easy is not responsible for any of the other choices available in the drop down box, just the Storage Made Easy Option. For example if you wish to access your Google Docs via Storage Made Easy you still need to choose the Storage Made Easy option as outlined above. You can filter your files using the file filter from the menu bar in the top right hand side. 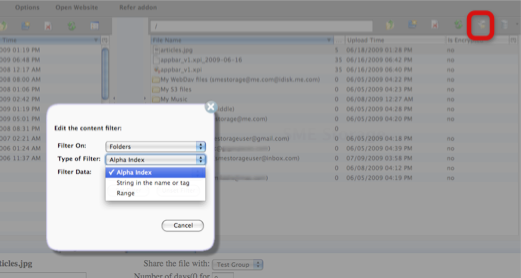 Filter allows you to filter your files down using Alphanumeric, String or Range filters. If your content is filters your will see in your Cloud Storage Path Bar that “your content is filtered”. Filtering is useful if you have hundreds of thousands of files and can speed up loading. Remember if you upload files and cannot see them it could because you have a filter set that ignores them ! 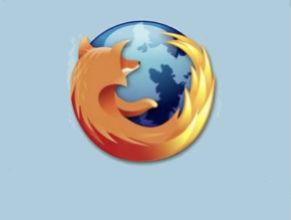 The Provider Option to the very right of the Firefox toolbar when logged into Storage Made Easy lets you change the Cloud Provider that will be used for upload if you have a lifetime Cloud or Multi-Cloud Account with StorageMadeEasy.com. , Clicking the DataBase type icon on the right hand side of the menu-bar drops down the current providers you have available. A green tick is against your default primary provider. You can choose another provider at anytime. Remember that if you change providers this will become you default provider for uploads unless you change it back. Any business Groups that you have created can also be navigated from the Firefox plug-in. At the bottom of the screen, when you click on a file, there are two tabs. The first tab show you the status of the file transfers. The second Tab lets you edit Tag or Description information, or share a file with any business groups that you have setup. 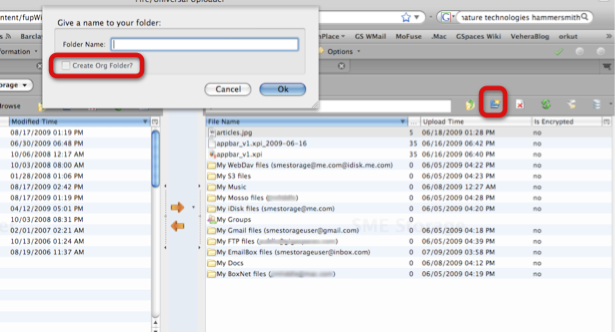 Create a Folder does exactly what is says on the tin i.e. creates a folder in your Cloud Storage environment. If you are an Organization Cloud user you get the option to Create an Organization Folder which will appear in all your Organization users accounts also. If you are not an Organization User this options will be grayed out. 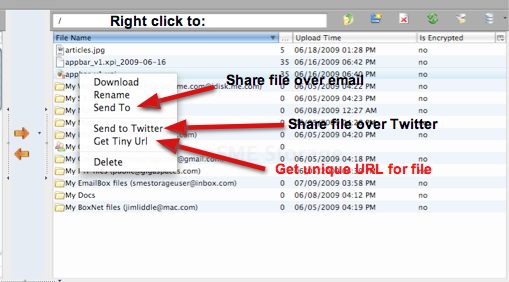 (5) Get Tiny URL - This gives you a Tiny URL Link for you Cloud file that you can use on Blogs or elsewhere. After clicking 'Nominate for Sync' you will be given the option to mirror the directory to the cloud or vice-versa by choosing the drop down “Mirror to Right” or Mirror to Left“. 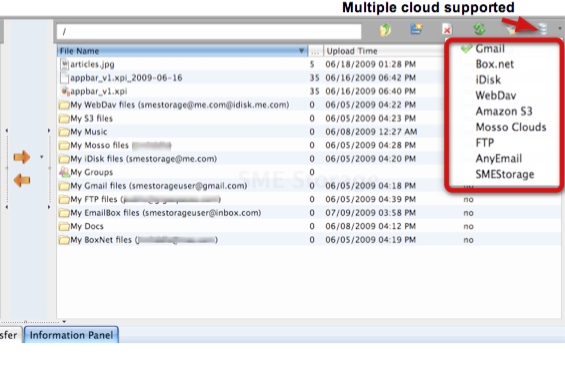 All directories uploaded to the cloud reside in the “My Syncs' Directory. You can actually keep multiple directories in Sync using this option and best of all it is Operating System independent so it will work on Mac, Linux or Windows.